Image Size: 31" x 19.5"
(Magazine Cover: Aviation History, Legends of Flight) Richard Ira Bong’s third confirmed aerial victory on 12 April 1944, over Tanahmerah Baai, near Hollandia, Dutch New Guinea…Flying on this mission with the 80th Fighter Squadron, 8th Fighter Group, 5th USAAF. Lieutenant Adams is in the P-38 (farthest) from the viewer. The aircraft impacting the water is a Nakajima Ki-43 Hayabusa (Allied code named; OSCAR), as is the Japanese aircraft in the background. 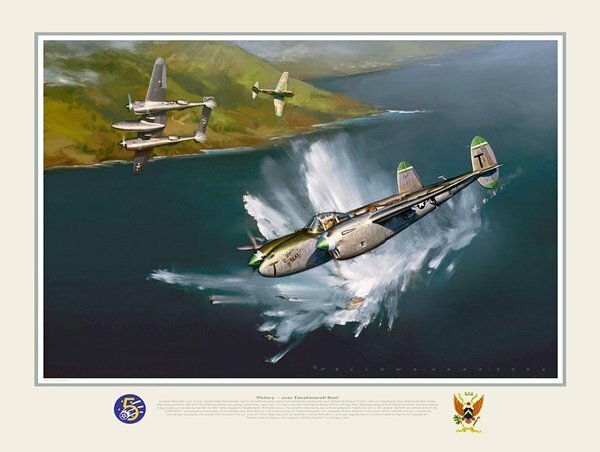 On this mission Bong was flying a P-38J nicknamed “Down Beat,”… crewchief Sam Scher. It was on this mission that Bong became the first Army Air Force pilot during WWII to exceed World War I American Ace Eddie Rickenbacher’s aerial victory record. Ironically, at the time of this event, Rickenbacher was fighting for his life in a raft in the Pacific Ocean after his aircraft went down at sea.